The configuration of this school is for the bookwork (what we call the coursework) to be on line and the hands on training to be done in Florida. This is similar to the way I was trained in veterinary school. There is always a vocabulary and theory part taught in the classroom followed by the application of that information in the clinic and hospital. The coursework is divided into 5 modules with each module split into units. After each unit there is a quiz which needs to be passed with a minimum of 80% before being allowed into the next unit. There is no time limit for the coursework and quizzes with the exception of the final exam. The final is made of 100 quiz questions picked at random by the computer with a 2 hour limit and a minimum of 80% for successful completion of the coursework. You are not considered a “graduate” but only someone who has completed the coursework. 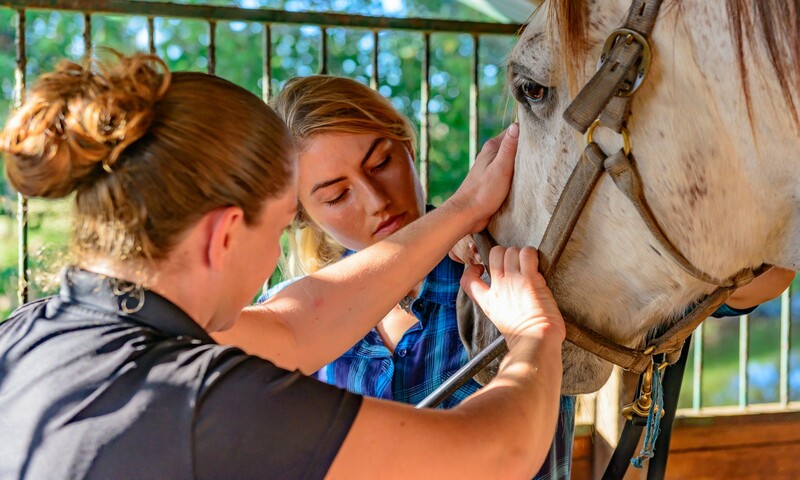 After completing the coursework and successfully passing the final exam, students will be able to spend a week in Florida for hands on training with an instructor in Horsemanship Dentistry. Students will be responsible for all food and travel expenses in addition to the enrollment fee. All of the training will be on the road working with horses in our home area. After successfully completing all of the hands on training (5 days) students will then be classified as graduates of the Horsemanship Dentistry School. There are payment options available for the hands on training; however, all payments must be made before the hands on training can be taken. Also we have come to realize that learning dentistry in horses takes a lot of time – years and thousands of horses. You must be committed to learning both horsemanship and equine dentistry. We give you all the fundamentals needed to work to become excellent at Horsemanship Dentistry. We are always looking for talented horsemen with exceptional personality, exceptional integrity, exceptional motivation, exceptional honesty and with an exceptional work ethic because in about 5 years we will need someone to work here in Florida permanently. That search needs to start with the graduates and this is why there is a certification program. Certification is split into 5 levels followed by an instructor level. It is a way to show your level of competency to us as friendly evaluators. It is based on developing mastery in equine dentistry, horsemanship and integrity. If you only do the coursework you will have all the information needed to actually effectively float horses. Hands on training helps you to quickly become effective. Certification will hold you accountable and drive you towards mastery. If you want more information on this please just call me to discuss it. Enrollment is EASY and AFFORDABLE. Enrollment in The Horsemanship Dentistry School is probably a “Done Deal” for you except for the cost. Some of us have the funds available and can pay for a bundle that has everything included. Others are struggling to get ahead and can only take small bites at this. The bottom line is that every school costs something. The money spent on enrollment adds value to your commitment of that education. As someone who spent a LOT of time and money to become a veterinarian, I know this well. Investment means that you become vested in the outcome of your education. It means that you really want to learn Horsemanship Dentistry. You have a choice to purchase bundles with one payment which saves you money. You can also break down the enrollment cost of bundles into 2 or 3 monthly payments at zero % financing. There are smaller payment options of 4 to 12 monthly payments at 10% financing. All payments must be made in full before attending hands on training. There is another option of purchasing the coursework modules either individually or as a bundle and then later purchasing the hands on training module and even later purchase the certification module. Note – all modules must be completed in order. Advancement to the next module can only be done after completing the previous module. All payment options are broken down at the bottom of each individual bundle order form. Click on the bundle you want to purchase and read completely the notifications at the top of the page. Scroll down and you will see payment options. Choose the payment option you want (1 payment, 3 payments or 12 payments) and watch the actual costs appear in the form. Please remember that all payments must be completed before attending the hands on training. Military discount – 10% on any module or bundle. Thank you for your service. There is no GI Bill offered at this school. Veterinarians and actively enrolled vet students – 25% on bundles. Call for codes before purchasing.